Apply to be an artist in the 45th Annual Winter Park Autumn Art Festival! Applications are now open via Zapplication. Please read all rules below and visit the link below to apply. A limited number of corner booths will be available at a premium of $375. All applications must be submitted by Friday, June 15, 2018. Notification of acceptance will be in July. The Winter Park Autumn Art Festival is limited to 185 Florida artists, including the Best of Show, Award of Excellence and Award of Distinction winners from the previous year. Each booth is 10’ by 12’ and may not be shared. Judging will be held Saturday, October 13, 2018 from 9 a.m. to completion. All awards will be presented at the Saturday Night Artists’ Party. *Prize monies will not be awarded if the Festival is canceled for any reason. In order to uphold the Festival’s longstanding reputation for accepting only superior quality work, screening is conducted by a separate panel of experienced and knowledgeable art professionals. Jurying is based solely on the quality of the work submitted. Two judges will be selected from prominent regional art professionals. As with previous festivals, the judges will have extensive backgrounds in the fine arts, as well as past judging experience. Judges for the 45th Annual Winter Park Autumn Art Festival will be announced at a later date. Entrants must maintain their principal residence in the State of Florida and prove residency upon request (e.g. a Florida driver’s license, auto registration, voter registration, etc.). Artists may apply in more than one category. A separate online application with digital images and entry fee(s) must be submitted for each category entered. Acceptance is a commitment to show. No refunds will be made for cancellations or inclement weather. Only original numbered prints such as lithographs, etchings and serigraphs may be displayed in the appropriate category. Any artwork, including photographs, that is produced by any mechanical means, i.e., photo-offset, or any other reproduction technique must be labeled a “REPRODUCTION” and placed in browse bins - one per booth. This rule will be strictly enforced by the Viewing Committee. Work that is unacceptable to show includes, but is not limited to, artwork created from works of the masters, commercial reproductions or products, copies, kits and all crafts defined as hobby work. Unframed, matted original work may be shown in your browse bin. Signed and numbered limited editions will be limited to 250 or less. All reproductions must be marked as such. Your browse bin may not take up more than 15 % of your exhibit space. Artists may only display work in the category(ies) in which their work has been accepted. All exhibited artwork must be accurately represented in the submitted images. Accepted artists must be in attendance during both days of the Festival. No stand-ins or agents permitted (although assistants are permitted). Booth spaces are 10’ x 12’ each and may not be shared. Artists are responsible for their own tents, tables and display material. Tents and displays should be strong enough to withstand crowds and poor weather conditions. Artists will be provided with and must display a card showing name, city of Florida residence, category and space number. Ribbons and prizes from previous shows or publicity materials may not be displayed. All exhibitors must abide by City of Winter Park rules in the Festival area. Artists are to collect Florida sales tax. Artists must leave their spaces clean after packing up on Sunday evening. 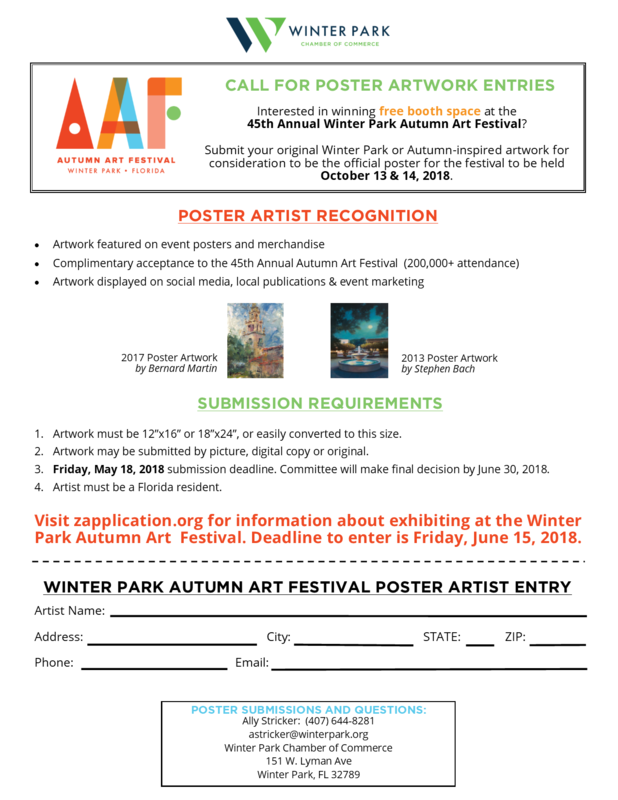 The Winter Park Autumn Art Festival will make every attempt to accommodate specific booth space requests provided on the application; however, there are no guarantees. A Viewing Committee will tour the Festival area on Saturday and Sunday to ensure that all Rules of the Show are followed. Any violation of these rules may result in expulsion from the Festival and forfeiture of all fees. Further instructions will be sent with artist’s acceptance packet.